One of the pattern pieces on this one has been stamped with a date of February 15, 1918, during a period when every middle-class family aspired to own a bungalow - perhaps one of those packaged by Sears, so the term Bungalow Apron is a bit of a marketing job. For a stated bust measurement of 40", the actual flat measurement at the bottom of the arm scyes is about 50". You get a total of seven sentences of guidance on construction. 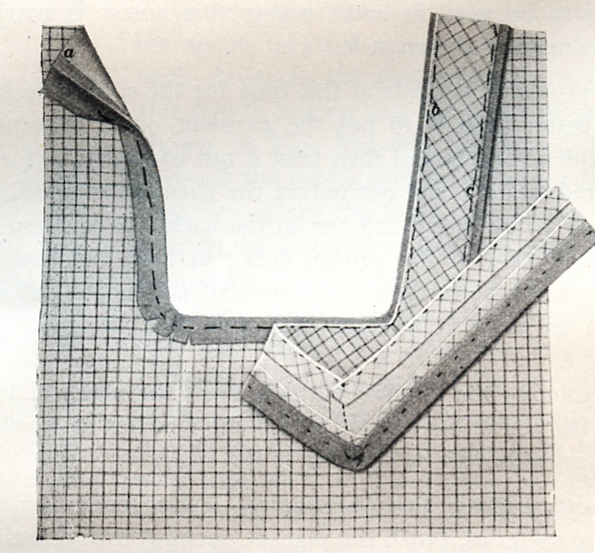 You're expected to know how to cut and apply your own facings, decide where to place your button holes, and, if you want to emulate the model on the left, know how to apply piping. The original center back length would have been about 55" before hemming. Notice that you're offered the option of facing the bottom of the apron. 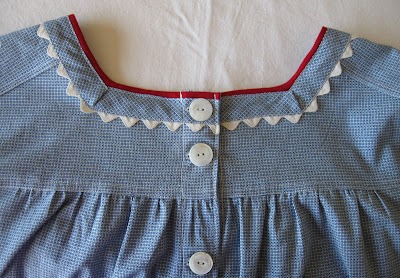 You could either cut facing from the apron fabric or use some other fabric that you'd thriftily pulled from your scrap bag. Given the curvature of the bottom, I'd probably cut a fairly narrow facing on the bias. I cut my apron 6 inches shorter than the original and finished it with a 2" turned up hem, for a finished center back length of 47". The layout doesn't indicate that the yoke is faced, so I didn't face mine, although if I were to make this up again I probably would. A yoke facing makes for a slightly heavier garment, but I think it's also stronger, and of course, the inside finish is nicer. 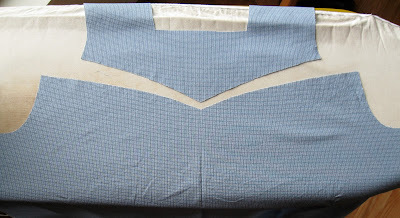 Note that the layout does show you that piecing will be required. My fabric was 45" wide, and I had to piece both the front and the back. 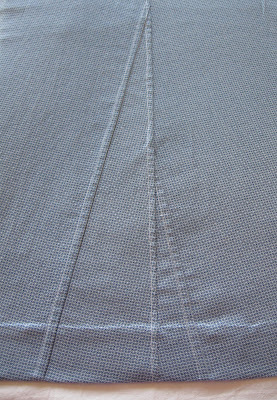 This is how the front looked once I pieced in the side gore. I flat felled this seam for strength. Here you can see the yoke and the front laid out, preparatory to the front being gathered and sewn to the yoke. I decided to make the short sleeved version. 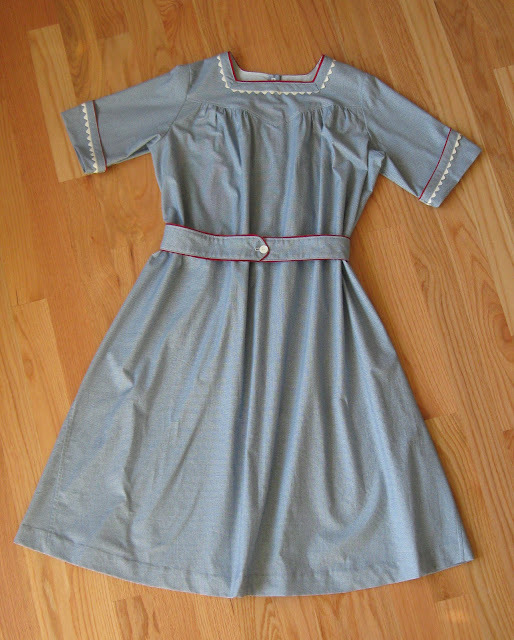 I thought the cuffs seemed to need a little embellishment, so I decided to finish both the cuffs and the neckline with piping, rickrack, and a bias band for the neckline, following an approach recommended by the Women's Institute in their book, Aprons and Caps. This is a good technique. 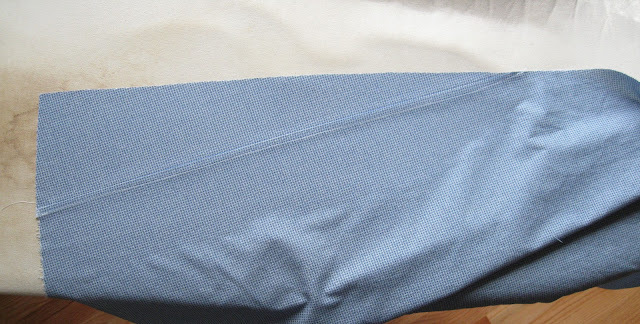 It can be done entirely by machine (except for the basting, which is really necessary) and gives a clean finish to the inside of the garment. 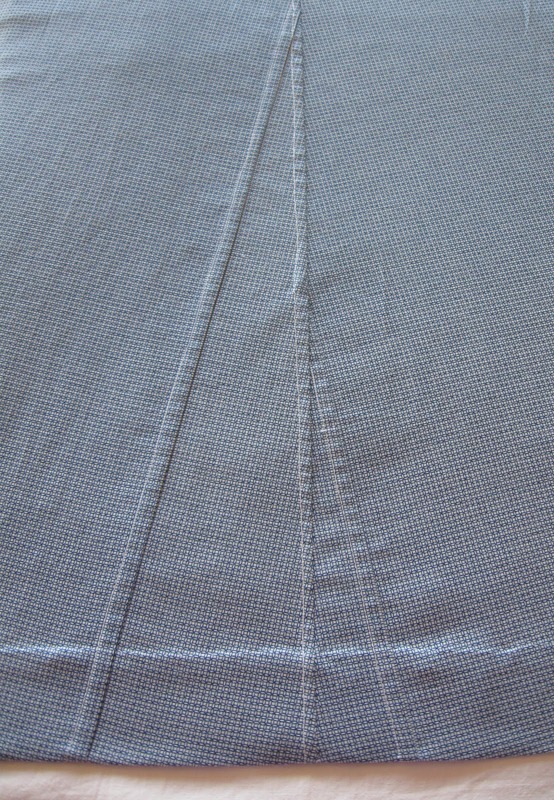 I seem to have missed the detail that the mitered corners of the bias band are actually cut and sewn. I just left mine folded. I suppose I could slip stitch them now. I had a little trouble getting the piping as narrow as I wanted it, I think because I didn't trim it down - it was just a bit too wide to behave correctly, even though I basted it in place first. The rickrack is from a box of trims that a neighbor of mine bought at an auction in southern Oregon. Most of the materials were in their original packages, but a few unpicked lengths were wrapped around old postcards dating to the 19-teens, so the rick-rack and the pattern are about the same age. All machine sewing is done on a model 201-K Singer treadle machine built in Scotland around June 5, 1945. The pattern offers no guidance on button placement. I ended up with a rather idiosyncratic placement. If I were to make this up again, I'd probably leave off that second button hole in the middle of the yoke. The buttons are vintage. I use a fairly large size button for these back-fastening aprons so that I can actually do them up. The button holes are worked by hand. 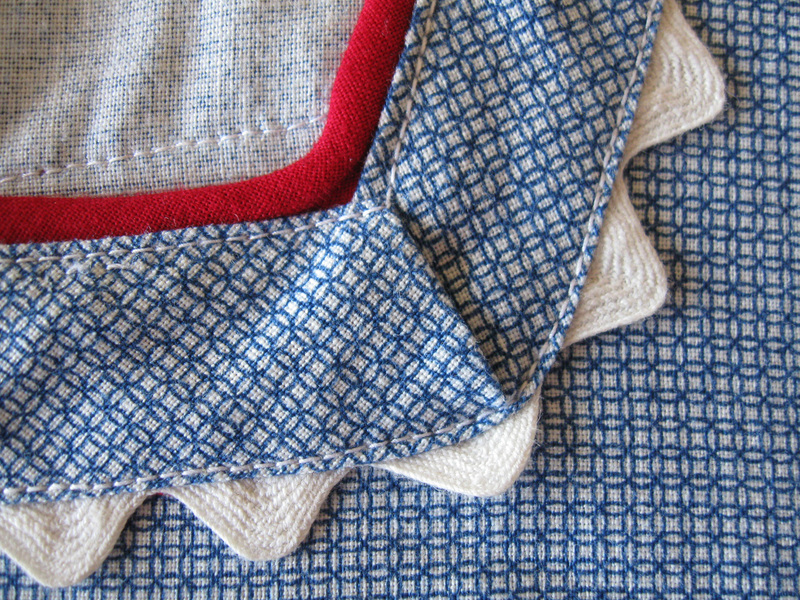 As it happens, it's entirely possible to slip into this apron without having to undo the buttons. If I make this up again, I may simply sew up the back seam and save myself the work of making the facing and the button holes. Here you can see the piecing on both the front (the larger gore) and the back (the smaller gore.) The side and sleeve seems were flat felled for strength. 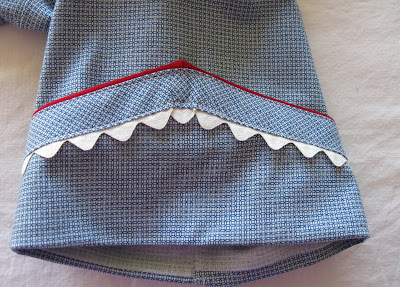 A feature that should be remembered about aprons and house dresses is that they are easy to launder; there are no fiddly bits to get torn in the washing and they lay flat for fast ironing. In a world before wash-and-wear fabrics, this is not a trivial thing. This bungalow apron has no pockets, which doesn't seem to be uncommon for these coverall/dress aprons. 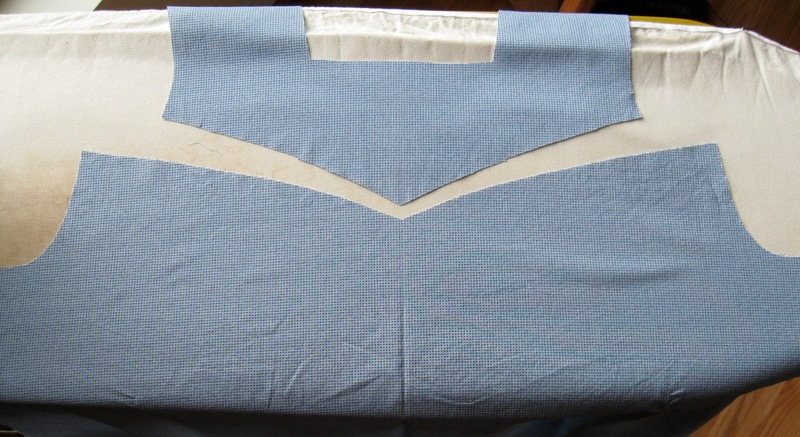 Here's a pocket-less kimono "apron" (no sleeve seam) from Aprons and Caps that's very similar to the New Idea bungalow apron. 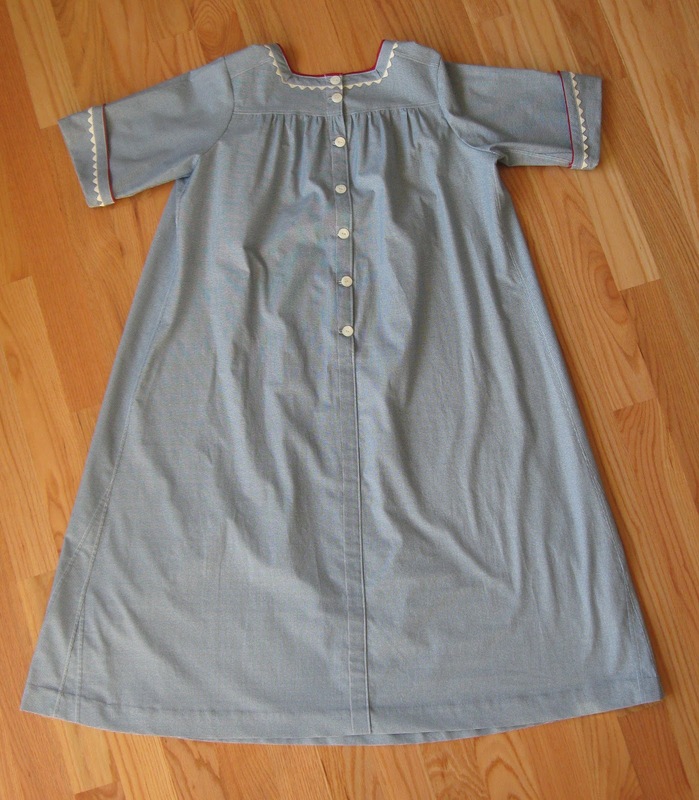 My mother has observed that her mother always wore an apron (with pockets) over her house dress. If you're completely taken with this design, you can get your very own copy through Past Patterns. This is a tracing of an original, so comes only in that one size, but the beauty of these is that they're easy to re-size. The pattern went together accurately, any misalignments you observe are generally the result of my getting lazy about basting. Originally posted on July 27, 2008. Re-posted on February 15, 2011 with revised and new content. This is reproduced from a 1926 source that states explicitly that bungalow aprons are worn alone, not over a dress. My guess would be that the bungalow "apron" evolved from sleeved coverall aprons like this, which does appear to be worn over a dress, and followed the progressive reduction in women's clothing in general, into the 1920's, when women were finally wearing so [comparatively] little, that there was no longer any point in wearing a dress in addition to an apron that covered everything, anyway. Past Patterns sells a reprint of your patter in a size 36 bust, if any of your readers are interested. I imagine it wouldn't be hard to re-size, either, since there's not much to it. 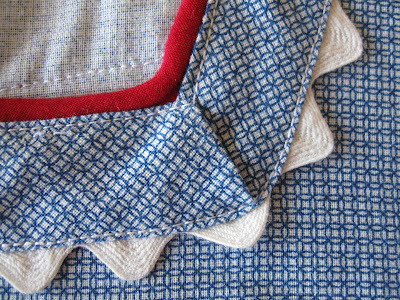 You did such a lovely job on this apron - it is beautiful for such a workhorse garment. the quality of that buttonhole you pictured does not escape me - nice! Thank 'ee Jim! Of course, I'm only going to show off the nicest ones. Last week I worked on some button holes that fought me every darned stitch of the way. Fortunately, they're mostly covered by the buttons! My vision of make-and-release is to find friends and family who will be willing to wear the garments I make up and return them to me periodically so that I can examine them, repair if necessary, and report back on how well home-sewn garments hold up over time and use. I think it will be interesting to chronicle clothing's entire life cycle. 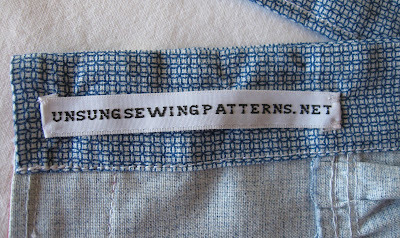 absolutely gorgeous sewing. all this vintage boom at the moment, everybodys out for the party dresses. i want the home-versions, as i get covered in glue, food and other bits with a kid and a dog around...so dressing up in party frocks is not my thing. love your blog!